In August 2003, Malaysian government signed a contract for 18 SU-30MKM with Irkut Aircraft Production worth $900 million USD. 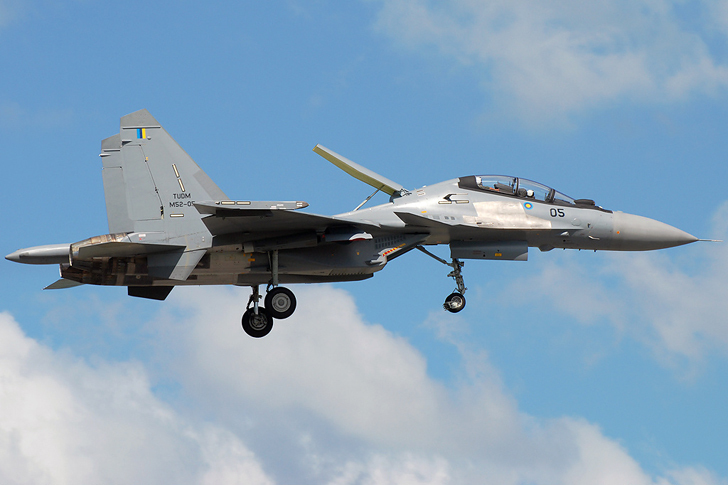 SU-30MKM/MKI is an advanced variant of SU-30MK/MKK fighter jets, which performance consider improved. It's design was added with canard. On May 2007, a roll-out and demonstration ceremony for initial of 2 SU-30MKM was held at Irkut Aviation Plant. F/A-18F Super Hornet is the main contender during tender evaluation process. MKM stand for Modernizirovannyi Kommercheskiy Malaysia - Modernised Export Malaysia. 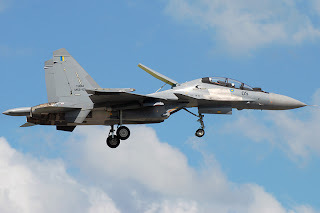 It's strongly similar with SU-30MKI with substantial advanced from original SU-30KI export version which maintaining basic air-frame but incorporating numbers of advance system from SU-35/37 project. SU-30MKM/MKI can category as Super-maneuver via digital Fly-by-Wire, canards & 2 x TVC Lyulka AL-31FP (+/- 15 degree) engines producing 27,500 lbs thrust each with afterburners. SU-30MKM can reach 3,000km maximum range without re-fueling & 5,200km with in-flight refueling & maximum speed of Mach 2.35 (2,150 km) at altitude with 17,500m ceiling. It has an advanced in close-in fights where pilot can rapidly point the plane at potential targets then use R-73 / AA-11 Archers SRAAM with IR seeker, launch & quickly change direction to avoid from enemy aircraft target/attack. It's equipped with NIIP N011M BARS phased array radar for long range aerial combat which can track up to 15 targets & engage 4 targets simultaneously. For EWS (Electronic Warner System), Optic-Location System (OLS) with laser range-finder (manufactured by Russian) was fitted. SU-30MKM was a multi-role fighter aircraft with ground attack capabilities and integrated with Thales Damocles Laser Designation Pod (Thales) surveillance & targeting pod that will improve capability for precision ground attack. It also equipped with rear facing radar, HUD (Thales), NAVFLIR (Navigation Forward Looking Infra-red) (French). Missile Approaches Warning System (MAWS) & laser warning sensor (LWS) supplied by SAAB Avitronics of South Africa. SU-30 MKM can carry a wide range of weapon loads (up to 8,000 kg) under it's 12 hard points. Munition - Guided bombs (KAB-500 / KAB-500KR / KAB-1500KR / KAB-1500K), 80mm & 130mm rocket pods & S-25 250mm rocket. Air-to-Air Missiles - It can bring 2 x R-77 (RVV-AE) / AA-12 Adder which can launch simultaneously to engage 2 targets at the same time, 6 x R-27E (AA-10 C Alamo C) / R-27 TE (AA-10D Alamo D) medium range air-to-air missiles where it can be loaded with 2 x AA-10D with 6 x R-73E infra-red SRAAM in a mission. Standard aerial weapon for beyond visual range engagement is AA-12 Adder / R-77 AMRAAMski. It also can carry IR guided AA-10 Alamo that provide no advance lock-on warning & could even equipped with long-range 'AWACS-killer' (KS-172 Novator) missiles. For strike mission it can carry large loads (up to 8,000 kg) on 12 external hard points & diverse weapon loads for quite good radius range (up to 350 km). Many military observers consider SU-30MKI/MKM was superior to all US fighter aircraft except F-22 Raptor. This included F/A-18 E/F Super Hornets & F-15 SG. The main difference between SU-30MKM/MKI versions was SU-30MKI uses Israel avionics, ECM & LITENING targeting pods where SU-30MKM uses original Russian avionics with French Thales HUD, NAVFLIR & Damocles targeting pod & South Africa Avitronics for MAWS (missile approaches warning system) & laser warning receiver. Integration of weapons, radar & avionics system was successfully test on SU-30MKM. Later variant of SU-30MKI, SU-30MKI Mk.3 will be equipped with on-board HUMS (Health-and-usage Monitoring System) from South Africa Aerospace Monitoring and System (AMS) which provide hand-off monitoring of various component. It was reported that India new SU-30MKI Mk3 will be equipped with new NPO Saturn 117S turbofan engines & Tikhomirov NIIP Irbis E PESA radar (similar with SU-35S) or Phazotron Zhuk-AE AESA radar which will integrate with Brahmos anti-ship/surface cruise missile. I am a simple guy with interest in new technology.